Amal Al Qubaisi received an honorary Doctorate in Philosophy from DCU. Image Credit: Julien Behal for The Irish Times Online. Al Qubaisi was conferred with a doctorate in philosophy by DCU before meeting with President Michael D Higgins the next day. 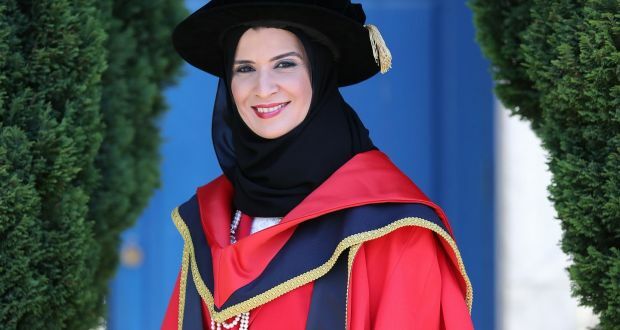 “Amal Al Qubaisi is a worthy recipient of an honorary doctorate in philosophy,” said Dr Ethna Regan, Head of School in Theology and Philosophy at DCU. Amal Al Qubaisi was the first female ever elected in the United Arab Emirates (UAE) and subsequently was the first female leader of the Emirates national parliament. The 48-year-old is now the president of the Federal National Council in the UAE. “If there’s one word which captures what she stands for it is tolerance, an increasingly rare attribute in a world of coarsening values, xenophobia and rampant populism,” said Dr Brian MacCraith, DCU President, about Al Qubaisi. Amal Al Qubaisi also attended the launch of DCU’s new Centre of Excellence for Diversity and Inclusion last Thursday, which is the first of its kind to be opened in Ireland. She was joined by Employer Disability Information HR & Disability Project Manager, Seònaid O’Murchadha, Founder of Empower The Family, Deborah Somorin and Director of the Centre of Excellence, Sandra Healy. Image Credit: Julien Behal for The Irish Times Online.